On Robert's request we took a look at the music playback of shared iTunes libraries by the iTunes control in the media center and have expanded a pre-relase version of nessMediaCenter and nessViewer. 1.) 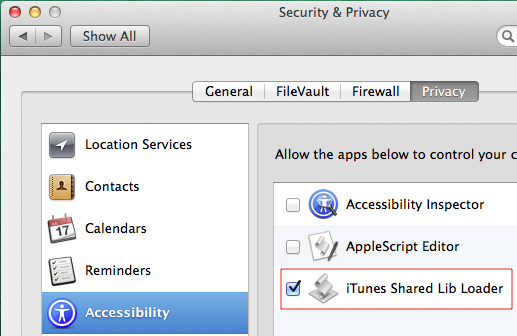 A library has been shared in iTunes on one computer (s. iTunes preferences and there "Sharing"). 2.) In the shared library, there are playlists with unique names that contain only music. 3.) On another computer, the shared library has been integrated in iTunes. The playlist names are important. "Music" as an example exists in this case (pt. 3) for example twice: the default local music playlist and the default music playlist of the shared library. The local default music playlist can be selected via the iTunes control of the media center, but not the default music playlist of the shared library (because its name is not unique and iTunes does not allow to rename the default music playlists). Another requirement is that iTunes has loaded the shared library once after each launch - otherwise the playlists of the shared library are not available in the iTunes control. Due to various dependencies (accessibility configuration, iTunes version etc.) we have created an external AppleScript application "iTunes Shared Lib Loader". After downloading and unzipping the file, this AppleScript application can be defined as a login item on each computer, so that after each computer startup it will automatically launch iTunes and then load the shared library. In the ZIP file there are also screenshots for Mac OS X 10.6 and AppleScripts for iTunes 10 + 11 which must be previously saved as AppleScript application ("only executable"). We suggest to test the AppleScript before and to adapt it if necessary. 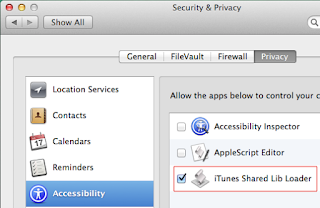 In the system preferences and there in the privacy settings (here version 10.10), the AppleScript application "iTunes Shared Lib Loader" must be allowed to control the computer (aka iTunes). Usually you will be asked the first time the AppleScript application is executed and then you can open the preferences by clicking a button. The iTunes interface (here version 12) must look like this - the leftmost icon for selecting the shared libraries. The AppleScript application automatically selects the first shared library which is then loaded.